When I came across the MUM site for the very first time I was surprised. I had never seen or heard of anything comparable before. I thought that this museum was a really great idea! The topic "menstruation" is still taboo and many people (men and women) don't exactly know how to behave or deal with it, because there are still few people (men and women again) who really understand the mental and physical processes or accept them as something as natural as eating or breathing. There are also many prejudices against menstruation coming from ancient myths. And the industry of female hygiene products brazenly exploits that. Well, part of my job is to inform young women and girls at schools about women's health and advise them concerning menstrual hygiene. I once posed a question to MUM, and I have to admit that I was not pleased that my question was answered by a male. Of course, I believed that a Museum of Menstruation could only be run by a woman. Well, I was wrong! Harry Finley is the proof! Of course, a man can never really "feel like a woman," but Harry convinced me that it is often better that someone not personally involved in a subject create a museum for that subject. For Harry, menstruation is interesting from the standpoint of the history of culture. The MUM site is unique and marvelous. I never saw something of that complexity before so full of information. Maintaining and updating those pages is a lot of hard work. I would almost say that the MUM pages represent a kind of online museum. You can find everything that has to do with menstruation in the broadest sense. Recently Harry asked me to provide him with news from abroad from Germany or Europe. It's a pleasure for me to do that. My name is Petra, I am 31 and I live with my husband, my daughter and a little cat in a small village in the beautiful landscape of southern Germany. My career started when one day I was asked to stand in for a friend who got sick and do her job as a counselor at the health department for three weeks. As I was already engaged in such things at a high school, I got to like it and I decided to stay with it. I also work as a bookkeeper, but I have the liberty to divide up my time by myself. Is housework really only "child's play? No, certainly not. 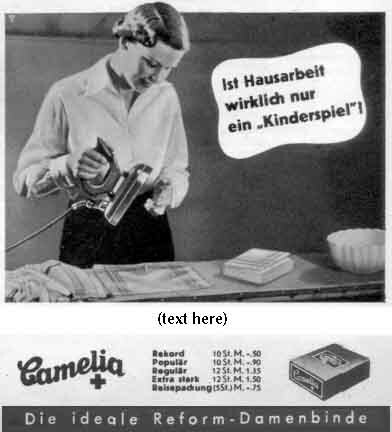 Science found out that, for example, when ironing, a woman consumes as much power as if she were carrying 26 kilograms. This doesn't matter to the woman pictured here even in the worst days of the month. You can see how cheerful she looks! Just the type that manages her life always with a smile on her lips. Don't you want to be as powerful, and fresh and bouncy and never suffer from the critical days?! Get help from the modern Camelia hygiene, because Camelia protects you from all unnecessary troubles. Camelia, the ideal reform sanitary pad, preserves your working power, your freshness and your good mood. Because of their great absorbency, the numerous layers of finest Camelia cotton wool (cellulose) give you the feeling of utmost safety and enable discreet disposal, whereas the unique Camelia belt supplies trouble-free wear. See another, earlier Camelia ad (at the bottom of that page).